Cooling Vests – a fab one for me please – . One of my biggest problems since this summer is dealing with hot temperatures.Another great MS symptom and most MS patients suffer from heat intolerance. Luckily, I live in Amsterdam = 360 days of rain, but of course, I’d love to travel again once I feel better and not only to the Nordics as my doctors recommended. I thought it’s a joke the first time I heard about a cooling vest, but yes, they do exist and seem to work perfectly fine to keep your temperature down. 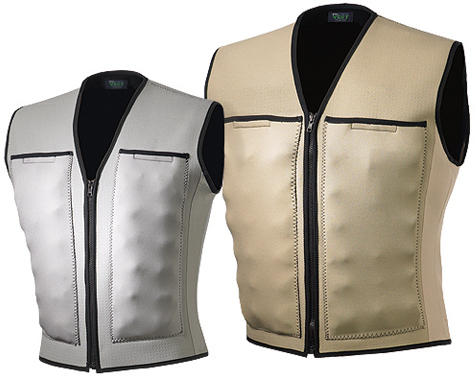 Unfortunately they are not pretty ( at all ), they look like some kind of a bulletproof vest and come in odd colors…yes, I know, it’s not about the looks but functionality but hey, having MS and heat intolerance is bad enough, if I ever wear one it should be at least a bit fab. I don’t want to look like a SWAT team member about to raid a crack house, and I am not sure how an under vest would work in summer. An under vest under a dress, nay. ;}Thanks Elina! Have a nice weekend!